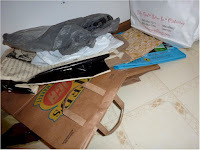 Original Content: Can't Say Enough About Recycling And "Saving the Planet & Stuff"
Can't Say Enough About Recycling And "Saving the Planet & Stuff"
A few years ago, I did a post here at Original Content called The Annotated "Saving the Planet & Stuff" Part Eleven: DIY Recycling. You can go back there to read an excerpt from the book in which main character Michael Racine surveys the items his hosts, Walt and Nora, have been holding onto for years in order to keep them out of a transfer station. Their plan is to reuse them in some way. Not only will they then have kept them out of the transfer station, they will have avoided using new resources to make whatever they've done with them. I so understand what they were doing. Today I'm going to do some more on this recycling idea, mainly because I've got a bunch of pictures I've been saving for this purpose. My most successful recycle. 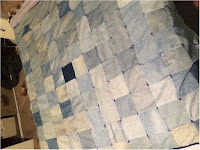 Making a quilt from used denim. 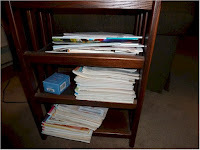 I'm starting with my most successful experience with recycling, because with short, business-like nonfiction you want to put the juicy stuff upfront in case your readers wander off. So my greatest recycle project was this denim quilt. Denim, the kind that isn't the result of an unholy breeding program with Spandex, can be used for a lot of things. So I have a lot of used denim. And I am hanging on to this stuff no matter what. It will move with me wherever I go. It will have to be pried out of my cold, stiff hands. I made a good-size denim bag for a gift a couple of years ago, and if I am ever able to have the DIY Weekend Sewing Retreat I keep talking about, I'm going to make one for me. A family member once gave me a pair of used denim pants for my denim collection. The pants were actually in better shape than some I wore. Those are in my closet now. That's recycling, too. My second most successful recyle. Cutting up Christmas cards to make name tags for Christmas presents. Honest to God, this was a thing years ago. You saw it in magazines. If you own a pair of pinking scissors (and I do), you can make these look pretty good. You ought to also get yourself a paper punch. And some curling ribbon. Yeah, this is some work. This is a DIY project that's on it's way out, because if you really want to be environmental, you don't send Christmas cards. Plus more and more of the people who do send Christmas cards send personalized ones with their family members' pictures instead of generic Christmas scenes, because they're easy to do. Probably easier than cutting up traditional cards, punching holes in them, and stringing them on the curling ribbon you wrap around presents. on to bubble wrap that came in packages we received so that when we had to mail something, we could use this perfectly good stuff and not have to buy more. Turns out, we don't mail that many packages. 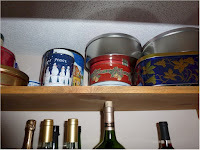 Gift tins. Walt and Nora have some of these, too. 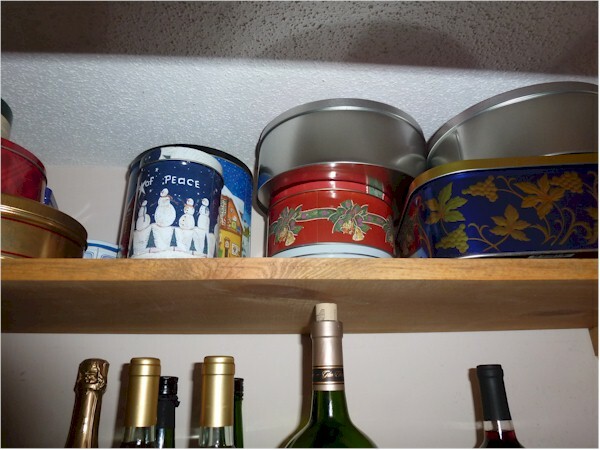 This was a little more useful back when I was a part of a mom world whose members all baked for one another at Christmas time. Everyone went back to work, and it's all we can do to bake for our families. 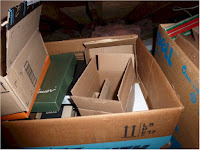 Cardboard boxes. This became a huge attic collection. We had a used gift box collection up there, too. 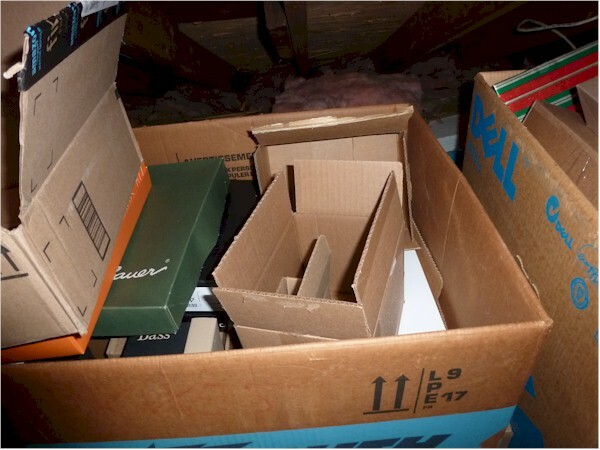 Walt and Nora have a box collection, also. "Plastic sacks filled with more plastic sacks." That's a quote from Saving the Planet & Stuff. Yes, I have a plastic bag collection. Two, in fact. And I have a paper bag collection. I should have placed this higher in the post, maybe as a third most successful recycle. It only seems unsuccessful, because it's on the floor of the pantry. But I reuse bags a lot. And then there is my Yoga Journal collection. 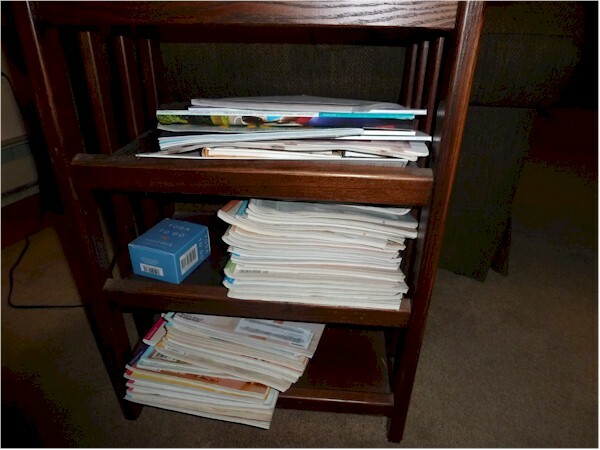 I had years of those things, because the articles were so good and I spend soooo much time rereading magazines. 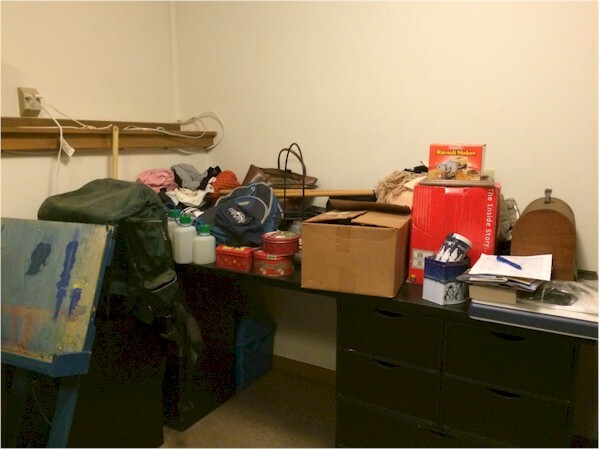 Taking care of a lot of stuff takes time. Additionally, a lack of order in surroundings can impact impulse control. And lack of impulse control leads to procrastination. So during multiple purges, I unloaded the bubble wrap, the gift tins, the Yoga Journals, and most of the cardboard boxes. I have never been that successful a recyler, definitely not on a par with Walt and Nora.